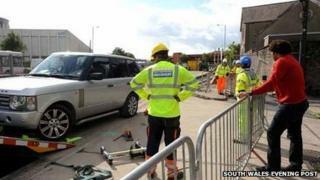 A dispute between former Welsh rugby star Colin Charvis and Swansea council over access to his carpet and flooring shop while roadworks are carried out has led to his car being towed away. Mr Charvis refused to move his car from the city centre site for contractors to continue digging a trench. He had been refused access to the car park and warehouse at the store front on Oystermouth Road, he said. The council said there was access from a side street and offered more help. Mr Charvis said he had seen a drop in trade since the works began eight months ago. Both he and a shopworker are going to have to go part-time in the next few months to keep the business open. "It's only really come to a head in the past couple of months when they've moved from the opposite carriageway to this side," he said. "In early August we discussed how my business could carry on operating. We set up a trial period to see if their temporary measures worked." Mr Charvis, who won 84 Wales' caps during his rugby playing days, said he no longer had access to his warehouse or car park on Oystermouth Road. The council had agreed to help him move carpet around the building through the roadworks into the warehouse. However, he said this help had not materialised. "I have a covered area and a car park, but because of the dust I can no longer keep stuff outside and customers can't come and park in the car park. "I have been asking a council representative to meet me to discuss how the temporary measures didn't work but I'm obviously being ignored. I asked for similar measures to the LC [Swansea leisure centre across the road which still had access points while work was going on] but didn't get them," he explained. Mr Charvis said he accepted the fact his car was on the road before it was towed away was his own doing, and that he had refused to move it. Now he is considering his options - including closing, moving to the outskirts or to another town. "There is nothing I can do. I have been bullied into a corner which has obviously cost me my car. "Rather than spend my time arguing and fighting the council, I need to concentrate on the business." A Swansea council spokesman said they had met Mr Charvis several times to discuss his concerns. "It's not possible for vehicles to park on the construction site outside his business at the moment because that would be unsafe," he said. "Access to the LC and Mr Charvis's business are very different - the LC only has one access point for services and deliveries, whereas Mr Charvis's business can still be accessed from York Street. "This is why we've agreed a number of temporary measures with Mr Charvis that include access for deliveries and pick-ups from York Street, cones to help mark out a designated parking area for his business and help for moving large rolls of carpet." The spokesman added they were happy to discuss any reasonable measures Mr Charvis feels may help while the works continue.